Morris Construction – For all your commercial & residential rock, sand, gravel, & dirt work! The most dependable crew for all dirt, rock, sand, gravel and much, much more! Take a look at some of our satisfied customers. Looking for quality work at an affordable price? Let us help. We specialize in all types of dirt work, rock, sand, gravel, and excavation. We create house pads, level ground, fix drainage issues, dig trenches, clear land, and mulch trees. We can install or repair driveways. We have our own rock yard where we stock all sorts of material to complete any type of job. 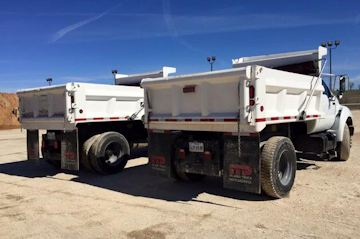 We have rock, sand, gravel, recycled asphalt, and more. Your driveway will be better than ever once we analyze your situation, make recommendations, and complete the work in a timely manner with exceptional quality and service. We have the right equipment to clear any piece of land, install culverts, and form solid driveways that will let you pass in all kinds of weather. 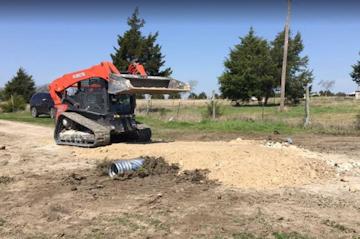 Hire us for our skid steer services, including grading, clearing, leveling, excavating, delivering and spreading all types of rock, sand, gravel, and asphalt. We do it all! We even sell firewood and storage containers! Browse our site to see more about our dirt work services! We can complete jobs in Hunt County, Rockwall County, Collin County, Hopkins County, and even beyond. Don't hesitate to call us. Now is the perfect time to have your driveway checked for thinning areas and pot holes before the winter weather sets in. Let us fix your driveway or install a culvert today! We do what we love, and we love what we do! We are passionate about every job we tackle. No job is too large or too small. We strive to please each and every client with a job well done. Our repeat customers are a testimony to how hard we work to make our customers happy. We have a proven record of honesty and dependability. We stand behind our work. Every project is completed with integrity. Our business would not be the success it is today if we ran it any other way. With thousands of successful projects and satisfied customers, we can easily say that we are one of the most reliable companies in this business. We invest in our equipment so that you can have confidence investing in us. We are committed to completing every project on time and to the satisfaction of our customers. We keep our equipment in the best condition so that we can complete every job efficiently while giving attention to every detail so the job is done right the first time. Morris Construction Company has been in business since 1979. We are individually owned and operated. We work all around the Hunt County area and beyond. I can honestly not say enough good things about Morris Construction. Mike, Connie, and Scott are all amazing. They are so kind and do incredible work at a very fair price. They prepped my ground for a covered riding arena to be built and created a pathway from our barn to the arena amongst other things. Their ethics as business people are unrivaled. Highly recommend. You will not be disappointed. If I could go 10 stars I would. We had neglected our road to a point where we were having to walk up when it rained. Morris Construction came in and went to work. Outcome was a great road that has with stood all the resent rains and still looks great. Trust this business will do you a great job at a fair price. 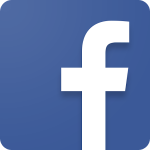 When i needed help, friends suggested your company. Boy, am I glad they did!! You guys were Awesome!! Mike, Connie and Justin were a great team. Very helpful and knowledgeable, and worked hard to beat the rain. I feel confident my house will be longer float away, nor will my yard become a Lake.. Thanks Morris Construction!! Wow! Mike and Connie are amazing! They have gone over and above our expectations! They show up when they're supposed to and get everything done quickly and efficiently! My husband and I can't say enough good things about them! Very impressed by how fast they could get my driveway fixed. Great pricing and awesome work. So thrilled we gave them a call. Love love love my driveway now. Thank y'all so very much. Definitely will be calling y'all for more work.